As requested, attached is the final version of the Comprehensive Plan for the City of Erie. It complies with all pertinent planning laws of the Commonwealth of Pennsylvania, and shakes hands with the contours of Emerge 2040. It is now ready for referral to the Erie City Council by the city's Planning Commission once the Commission has conducted its review and made its recommendations. The document you now have is absolute state of the art; nothing like this exists in the U.S. today as a guide for how to dig out of a protracted weak market situation such as the one Erie is now in. This transmittal fulfills our contract with the City of Erie. We strongly encourage elected and appointed officials to embrace resulting discussions and participate in a full-throttled conversation about what such a future course for the city entails. The time has long passed when Erie had the luxury of assuming future prosperity, and of not having to make hard choices. The only reality now is that future prosperity might come from making choices few will enjoy making. During forthcoming review, first by the Planning Commission and later by the City Council, there will be the opportunity for Commissioners and City Councilors to enter into a dialogue with the community about the long term health of the City of Erie and how to obtain it. We strongly encourage elected and appointed officials to embrace resulting discussions and participate in a full-throttled conversation about what such a future course for the city entails. The time has long passed when Erie had the luxury of assuming future prosperity, and of not having to make hard choices. The only reality now is that future prosperity might come from making choices few will enjoy making. In an important way, how Erie got here is a less pressing matter than that Erie is where it is. In point of fact, Erie is at a crossroads, and, make no mistake, the clock is ticking. - There are some 4,700 vacant housing units in Erie – the equivalent of a small, empty city. Assuming that this equates to 2,500 empty structures, and that each of those properties will cost roughly $10,000 to acquire and demolish, that's a $25 million bill. Or if it costs $50,000 on average to acquire and rehabilitate those properties into a marketable condition, the bill is $125 million. Erie only has a fraction of these amounts on hand, so being really smart with the few dollars it does have will mean deploying them in politically unpopular ways in order to make any difference at all. - Erie now has 33 percent fewer middle and upper income households in the city than it had in 1969; so there are far fewer tax dollars available to take care of a city that now has 40 percent more infrastructure than it needs. Again, being really smart with the few dollars the city does have will mean spending them in ways sure to disappoint some constituencies; leadership will be required to find a balance between being purely smart and creating a sense of fairness. - Erie County's population has been flat for 36 years, so the region isn't in a position, never mind of a mood, to bail the city out, no matter how culpable it may be for the state of the city by virtue of suburbanization. Yet partnership is a must. Where will leadership on this front come from? - The average sale price of a house in very good condition is $157,000 when the house is surrounded by similar properties. That price drops to $91,000 when the house is on a block where maintenance standards are in the middle – with numerous properties showing at least small signs of disinvestment. And the price falls to $52,000 when that very good house is on a block that is noticeably distressed – a scenario that costs the city approximately $1,200 in property tax revenue each year as a result of stunted property values. Who in a position of authority will walk the community through the net benefit-cost ratios of the various approaches available to the city? There is no doubt some in the community will want an easier, softer way. With all the earnestness at our command, we beg of you to be fearless in the face of resistance to change and be thorough from the very start. By holding onto old ideas the result for Erie will be nil. Half measures will avail Erie nothing because your city is at a turning point. Of course, the sky is not falling, and there is ample cover to be found under the protective skirt of inaction, or of work avoidance, or of staying the course with business as usual. If Erie's near future is characterized by a continuation of the status quo – beginning with how this draft comprehensive plan is rolled out and debated, then the city's long-term future can be seen by visiting Camden, New Jersey, Flint, Michigan, Youngstown, Ohio, or Gary, Indiana. The choice of which road to take is now squarely in your hands, as will be the responsibility years from now, for which path was chosen. Fortunately, the Erie community is full of energized, smart, hard-working, committed civic voices who both want to make a difference and are prepared, now, to start breaking with the status quo. We detected a significant appetite in the community to be leveled with, and for partnership. But those voices need to be mobilized. That means hearing them, and then being candid with them about the set of choices available, and about the real challenges and the real opportunities and the real work of tackling the former by investing in the latter. In the course of working on this long range plan for the City of Erie, our team was honored to work with and learn from many of the city's outstanding employees. Our team worked closely with the excellent staff of the Erie Regional Chamber and Growth Partnership, business owners, residents, members of the city council and planning commission, staff of the Downtown Partnership, staff and board of the Community Foundation and the United Way, the Superintendent of Erie's Public Schools, the Chief of the Police Department, and the outstanding leadership at the Erie Redevelopment Authority. We were fortunate to meet with county officials, representatives of Gannon, Penn State, and Mercyhurst, members of the clergy, and a number of community developers and activists. The Steering Committee for this effort worked hard over many months to guide the project and they deserve recognition. What we consultants were left with was the deep conviction that the Erie community is ready to get to it and get on with long overdue revitalization work. This is a powerful asset that must not be ignored. Indeed, in a city full of citizens hungry for community improvement, one spirited individual stands out. Our first contact with the city – in the fall of 2014 – was with the late Melanie Johnson, who pleaded with our team to leave no stone unturned and no fact hidden in the effort to begin the process of rebuilding her beloved city. We did not know at that time that Ms. Johnson was undergoing treatment for cancer. Only later, several months into the project, did we discover the extent of her illness; certainly her presence and energy at every meeting, beginning to end, gave no hint of the personal struggles she was facing. The only side of her she showed was her commitment to the City of Erie. Melanie Johnson took our team on tours of Erie. She took us to St. Stanislaus and explained what it meant for her to attend mass there, and, as a young child, to be picked up after school by her father. She walked us across the McBride Viaduct so we could see for ourselves the aging infrastructure of her city, and did so when she was weakened from therapy. Melanie explained the history of Pulakos Chocolates and who bought their Easter candy there, and who instead went to Stefanellis. She drove our team to see the house she and her husband bought in the West Bay when they were a young family and pioneering and hoping they might help reclaim her city. What she taught our team was that there was no time like the present to get on with the work, no matter how hard. That we could play it safe as consultants ... or not ... but that, regardless, the challenges would be there all the same. So it was up to us whether or not we really wanted to help. And when we put it squarely to her, asking what genuine help might look like, she didn't hesitate. "Give it to us straight. We can handle it. There's no sense waiting when there's work to be done. We could have hired someone else if we wanted it sugarcoated. Instead we hired you." That's a tall order coming from anyone. It's especially substantial coming from Ms. Johnson to whom our effort on behalf of her city is dedicated. Our effort is also a reflection of something similar we heard from Ms. JoAn Thompson, spouse of the late James Thompson, former city council member. It was Ms. Thompson who, in the middle of a somewhat disagreeable east side community presentation we led about the comprehensive plan, walked across a roomful of people displeased with the prospect of facing some unpleasant facts about the city's condition, and told me personally to "keep doing what you're doing. We need to hear it." The Erie community is in trouble owing to problems shared by many older industrial cities. These are de-industrialization, loss of population, and suburbanization. But while these are extremely hard problems to solve, at root, they are technical, garden variety, clearable hurdles. Far more noteworthy, is that Erie is in trouble less because of loss of jobs and less because of suburbanization and less because of population loss, and less because of petty bickering with the County, than because of the community's tendency towards self-inflicted wounds. In other words, self-defeating habits and attitudes in Erie are what's really in the way of prosperity. Specifically, our team observed three notable traits that explain aspects of the city's current state and require attention as Erie moves forward. If there is a more squandered asset in America than the City of Erie's shoreline, it is hard to imagine. For more than 100 years now, the community has acknowledged the need to integrate the city's downtown and neighborhoods with the Bayfront – and much has been done in the past 50 years in an effort to realize that goal. But those efforts have been inadequate and have, in many ways, worsened the physical separation of the shoreline from the rest of the city. If the City of Erie is to have a second act, optimizing the Bayfront for its cultural and recreational value, its real estate value, and its iconic value, needs to happen. Whether from comfort in the familiar or an unwillingness to expect more, the team observed several opportunity areas that the community has long neglected to invest in and optimize. • Architecture and Design. Erie's history, architecture, and location are among the most enviable in the United States, arguably on par with Savannah, the District of Columbia, and St. Augustine. Sadly, significant assets have been squandered, undermined by bad transportation planning, thoughtless housing development, and other decisions made largely between 1960 and 2000. 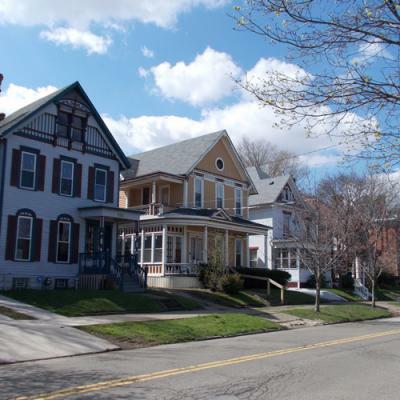 If the City of Erie is to find its way forward, it will almost certainly be by virtue of actions taken to strengthen the city's historic architectural and environmental fabric, which will be costly. Choices, in other words, will have to be made, which means that the community will have to prize and prioritize and pay for the preservation and redevelopment of historic buildings, parks, and boulevards. • Bayfront. If there is a more squandered asset in America than the City of Erie's shoreline, it is hard to imagine. For more than 100 years now, the community has acknowledged the need to integrate the city's downtown and neighborhoods with the Bayfront – and much has been done in the past 50 years in an effort to realize that goal. But those efforts have been inadequate and have, in many ways, worsened the physical separation of the shoreline from the rest of the city. If the City of Erie is to have a second act, optimizing the Bayfront for its cultural and recreational value, its real estate value, and its iconic value, needs to happen. • History of Entrepreneurialism. Erie has a long and distinguished history as a haven for new enterprises and industrious people. But today, one in every 13 employees works for just four employers – GE, Erie Insurance, UPMC Hamot, or the Commonwealth – a precarious situation for any city. Cities don't create jobs. But through policies and programs they can incubate the conditions that help gestate private business development. By reducing taxes on businesses, the benefit is job creation and the cost is a shifted tax burden. By investing in infrastructure – roads, fiber optics, parks, and related amenities – businesses can recruit ever stronger job candidates who in turn become contributing residents of the city. By making these investments the benefit is eventual competitiveness and the cost is increased taxes or changes to the city's spending priorities (or both). The city's long term prospects for true vitality require that Erie lay the groundwork for future business expansion. When the community is part of an adult conversation where facts are on the table and the community is sorting through the costs and benefits of competing scenarios, Erie is a city more than capable of innovation and growth. But this rarely happens. Our team observed a fractured community, as disaggregated as it was aggravated. Racial and class fault lines, for example, are easy to see, yet it was observed that ignoring them in public discourse has become commonplace. And there has been a narrative in Erie that the city's problems will be fixed by the arrival of another large employer, or a state grant, or some other form of wishful thinking. • Community Wisdom. When the community is part of an adult conversation where facts are on the table and the community is sorting through the costs and benefits of competing scenarios, Erie is a city more than capable of innovation and growth. But this rarely happens. Our team observed a fractured community, as disaggregated as it was aggravated. Racial and class fault lines, for example, are easy to see, yet it was observed that ignoring them in public discourse has become commonplace. And there has been a narrative in Erie that the city's problems will be fixed by the arrival of another large employer, or a state grant, or some other form of wishful thinking. In the planning team's engagement with the Erie community, there was a hunger to be told the truth. People energetically asked to be leveled with about the state of the city. Residents and business owners alike asked to understand housing values and excess road miles, tax rates and changing demographics. Denying the necessity of new taxes, or of racial disparity by ignoring the issue hasn't, doesn't, and won't make those and other difficult matters go away. The team also observed an adherence to certain operating norms – or "business as usual" – despite proven ineffectiveness. • Mistaking Cheap for Frugal. A poignant example of business as usual that works against Erie is the prevalence of "cheap." Whereas frugality once was a virtuous means of husbanding scarce resources so they could be saved or invested, Erie has fallen into the trap of cheapness. Since the 1960s, a once proud and beautiful Erie has permitted too many cheap projects. City Hall, for instance, or the Bayfront Connector – neither of lasting beauty or value. Too many homes became cheaply sided, first with aluminum and later with vinyl, undermining the city's charm. The planning team noticed this same tendency in maintenance as well. Roads are patched but not properly brought to par. In Erie there are 300 miles of roads to be maintained each year. At $18,000 per mile per year to maintain properly, the City of Erie should be spending $5.4 million a year. Each increment below this becomes deferred (and mounting) costs that require attention later. Cheap today at significant expense tomorrow is not serving Erie well. • Relying on Outside Funding. In addition to cheapness, a second counterproductive norm in Erie is the default tendency to look to the state or federal governments, or some other outside source, to solve local problems. When the suburbanization of Erie County became firmly rooted by the early 1980s, the exodus of the city's middle class was in full swing. In response, Erie increasingly looked to grants to fix gaps, and having predicated municipal spending on presumptions that did not materialize, Erie opted to close funding gaps with increasing reliance on outside sources rather than periodically rightsize. Whenever an outside source funds an Erie project, it must conform to the funder's expectations and rules. Such rules infrequently benefit the user without exacting a cost, and almost never fit local market realities. While Erie has become adept at getting outside help, it has traded away the indispensable value of self reliance. • Not Engaging Citizens. Our team observed that business as usual in Erie seldom includes real efforts to engage the community. As earlier noted, this is a missed opportunity. But it also constitutes a troubling norm. When a neighborhood's residents are not part of the conversation, they can easily lose confidence that their voice matters, and our team observed this to very much be the case throughout many city neighborhoods, especially lower income minority areas. It was observed that true dialogue is rare in Erie, and until that ceases to be the norm, the potential for recovery will be severely challenged. • Not Working Together. Many cities suffer from lack of coordination, and Erie is no different. City Hall and the County, for example, operate in silos, rarely communicating with one another with effectiveness, rarely sharing in the development – much less the execution – of strategies. Erie County, nominally better off than the city, is in for a rude awakening when the county's demographic time bomb goes off about the same time that its 1970s era housing stock approaches obsolescence. Yet city and county – in desperate need of one another – have not found a meaningful way to share data, goals, talent, and resources. The "X" factor in postindustrial cities struggling to transition to economic prosperity is not fiber optics, innovation hubs, or tax credits, but partnership and cooperation in the presence of such tools. Until the county, city, and other entities routinely work together, the region will suffer. Third, the team observed a troubling aversion to risk. Of the many lessons that Silicon Valley, North Carolina's Research Triangle, and Boston's 128 Corridor offer, perhaps the greatest is the value of failing often and quickly in order to succeed. • Not Placing Bets and Losing Anyway. Placing bets is part of leveraging the good cards in the city's hand. Underneath today's venture capital approach to seeding winners is a willingness not just to tolerate losses, but to cultivate them, embrace them, and therefore have something to learn from. This is the essential DNA of what is sometimes referred to as diffusion gatekeeping where "life on the innovation end of the continuum is volatile, fractious, and personal." Failing often to succeed when possible means spending and cultivating loss. It means investing in young entrepreneurs, placing bets, and figuring it out. Erie is rarely venturous with its public capital. • Who Else Has Done This? Often, what plagues Erie is waiting for someone else to trail blaze. Leave it to Erie Insurance. To Hamot. To Penn State Behrend. Or find an exact and successful version from elsewhere to replicate. One of the most troubling observations our team made in the year it evaluated conditions in Erie was the response from too many city officials who, when presented with possible ways out of the city's current predicaments, reflexively asked "where else has this been done?" By contrast, in cities that are succeeding in the postindustrial, technology-driven, service-sector economy, the response to the same proposition is "well, let's invent it." The approach that's needed is courageous experimentation and a willingness to incur losses. That of course means the taxpayer has to give permission to its representatives to be bold. This is not a problem of staff ability but taxpayer authorization. • Hedging Bets Through Half Measures. What also undermines Erie is a tendency to stay small and to underestimate the severity of the challenges ahead. In some sense, any step forward is progress. But if maintenance and attention is long deferred, bigger and bolder action may be needed. An example is the overdue redevelopment of the 12th Street corridor. Might it work? Yes. Would it be expensive to try? Yes. Is it guaranteed to work? Absolutely not. What is known is that an incremental, cautious approach to the redevelopment of a complex corridor is certain to fail. When these risk averse traits are combined – waiting for someone else to carry the load, going small against a big challenge, and an unwillingness to place bets – what becomes truly apparent in Erie is the lack of confidence parties have in one another. The paradox is that Erie has more than enough resources to pull out of its condition, yet no one party alone can do it and no party is confident that the others will be there for them should they venture out front; no one wants to be left stranded on third base. In a form of the prisoner's dilemma, no single party in Erie has sufficient trust in all the others to follow through, and so no one ventures forth with enough resources to bend the arc of Erie's universe. • Limited Trust. When these risk averse traits are combined – waiting for someone else to carry the load, going small against a big challenge, and an unwillingness to place bets – what becomes truly apparent in Erie is the lack of confidence parties have in one another. The paradox is that Erie has more than enough resources to pull out of its condition, yet no one party alone can do it and no party is confident that the others will be there for them should they venture out front; no one wants to be left stranded on third base. In a form of the prisoner's dilemma, no single party in Erie has sufficient trust in all the others to follow through, and so no one ventures forth with enough resources to bend the arc of Erie's universe. • Tough Choices Neither Posed Nor Made. Limited trust and overall risk aversion culminates in Erie putting off, or failing to acknowledge, difficult choices. The community isn't prepared to make hard choices unless pushed to do so and no one in the community – in any sector – has yet shown a willingness to do the necessary pushing. The draft we've conveyed, which is now in your hands, gives the Erie community a way through, and, eventually, a way forward to the other side. It won't be easy. It can be done. You have the tools. But durable change will only emerge if the community is mobilized and rigorous. Half measures will not work in the face of what are undeniably existential challenges. These may be hard-to-swallow observations. Top to bottom our team appreciates the enormity of the tasks ahead for Erie. But in the course of our work in your community, we found all of the tools needed for recovery. We found in the Erie Times-News and in the Erie Reader serious coverage of serious issues. In the Growth Partnership we encountered business acumen and staff talent equal to that found in any city anywhere. In Erie's ecumenical community we found a commitment to social justice and also a pragmatic hunger for what works. In the school superintendent's office we found expertise, humility, and gravitas. In the police department we found courage and compassion. In the County Executive office we encountered sophisticated, far-seeing, willing partners. In the philanthropic and corporate sector we discovered a deep reservoir of commitments to Erie and the expertise to lead. Most of all, in the community itself, we found a willingness to do what's required, if asked, and if mobilized. As we heard from Melanie Johnson, "there's no sense waiting when there's work to be done."